Lately Woody Allen seems to be caught up in nostalgia for the 1920’s and 30’s. His style of filmmaking and penchant for classic jazz music is perfectly apt for capturing old Hollywood and 1930’s high society. Then there’s Jesse Eisenberg, perhaps the most capable actor of portraying a young Woody Allen type. He doesn’t have the New Yorker accent, but he’s small in stature and known for playing the same sort of awkward, quick speaking leads we use to see Allen play. There are times in this film when Eisenberg gives a line that I could actually picture the words coming out of Woody Allen’s mouth. Certainly there was a time in which Allen himself would have played the lead character here. As if to hint at it, Allen even personally provides the occasional voiceover narration. It’s not hard to imagine why Allen would pick Eisenberg to play a version of himself. That character is Bobby Dorfman, the youngest member of a jewish family from New York hoping to move to Los Angeles to find fame and fortune. He finds work doing menial tasks for his Uncle Phil (Steve Carell), a powerful talent agent in near constant meetings with producers and famous names from the golden age of Hollywood. Phil does, however, help him out by assigning his secretary Veronica (Kristen Stewart), Vonnie for short, to see to it that he settles into life in LA. They seem nearly complete opposites at first. He’s a starstruck young man looking to integrate himself into Hollywood’s high society, and she’s a disillusioned young woman sick of the pretentious nature of Hollywood stars. Nevertheless, they become fast friends, and he falls for her just as fast. She appreciates his company because he’s sweet and naive - rare qualities in people in their line of work. Yet their would-be romance is shut down almost as quickly as it started when she chooses to marry the older man she’d been having an affair with. Bobby then moves back to New York where he utilizes his family connections to open a successful nightclub and meets an attractive divorcee (Blake Lively) who shares the name of his now lost love. Yet the film’s final act has Bobby and Vonnie visiting each other, which only reminds them of the feelings they’ve never gotten over. When it comes down to it, Café Society is longing for the past. Both old Hollywood and New York high society are rendered beautifully here by production designer Santo Loquasto, and cinematographer Vittorio Storaro. The film even opens with a voiceover, by Woody Allen himself, explaining the beauty of Los Angeles when the sun is setting. Allen describes how everything is illuminated with saturated colors as if by Technicolor. A fitting way of describing a city built on the film industry. Similarly, Allen’s film pops with color, but he also keeps a warm color temperature that gives it an aged, golden quality befitting a story taking place during Hollywood’s golden era. However, the setting seems to be nothing more than a novelty. Allen’s own longing for an era long gone. Speaking of old Hollywood, there’s a scene in which Stewart’s Veronica shows up with her husband at Bobby’s nightclub that evokes the reunion of Rick Blaine and Illsa Lund in Michael Curtiz’s far superior Casablanca. There are even hints of nostalgia for Woody Allen’s own past films. Many of the quirks of Allen’s past work, for better or worse, rear their head yet again here. He often has characters speak against pretension only to have another character give life advice by quoting someone like Socrates so he can try to spin it into a joke. However, the real problem with Café Society is the pacing. There is so much Allen wants to do here that when it isn’t flashing forward and montaging over the details it’s getting sidetracked by nonessential side characters and subplots. Bobby’s brother Ben (Corey Stoll) may have helped him become a successful nightclub owner, though that role could have just as easily been given to one of Bobby’s other well off friends, but the film truly drags in the middle spending too much time following Ben and his even more superfluous sister rather than concentrating on allowing the emotions of the two leads to germinate. And all of this distracts from the film’s theme of unrequited love that doesn’t seem to take shape until very late in the film. What if Curtiz had used up some of Casablanca’s runtime devoted to Rick and Illsa to follow Peter Lorre’s pestilent Ugarte instead? Though it might have made for a fun diversion, it would have been a diversion nevertheless, and one that ultimately took away from the central character’s story. And, of course as mentioned, Jesse Eisenberg initially plays Bobby as a quirky, neurotic Woody Allen type, but once he becomes a nightclub owner he is instantly a more confident leading man. The film flashes forward from one to the other rather than giving Eisenberg a chance to make the transition. Steve Carell seems miscast as the big name Hollywood fat cat so rich and desirable as to win over a young Kristen Stewart. Stewart, on the other hand, has become something of an indie darling, and she’s good enough here that the film feels lesser when she’s not onscreen. Blake Lively was good enough for her part, but I just couldn’t buy her and Eisenberg as a couple. Part of it had to do with their lack of chemistry and Eisenberg’s forced performance any time they were on screen together. If nothing else, their scenes together effectively made me root for him to spend more time with Stewart’s character. This is the third pairing of Eisenberg and Stewart (Adventureland, American Ultra, and now Café Society), as such they’ve learned to play off each other well, yet it isn’t enough to fix the rest of the film’s flaws. 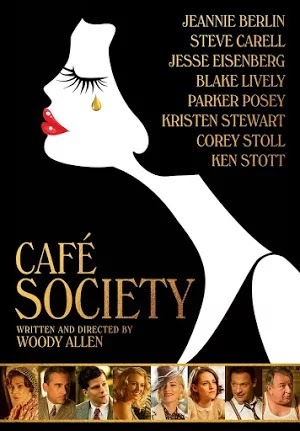 There is an odd clash of tones to Café Society. Its story is concerned with love affairs and seedy goings on in LA and New York, but Allen tries to maintain a bright, happy-go-lucky tone that doesn’t quite match. Very little of the film can be described as comedy. Yet it neither becomes the character driven romance of Annie Hall, nor the pleasant mix of drama and comedy of Midnight in Paris. Café Society’s story of unrequited love might have been better suited to an auteur like Wong Kar Wai, who would have undoubtedly added much needed poignancy. Allen’s light-hearted touch seems like the wrong approach. He fails to establish the longing that is so essential to the film’s central theme.